he decided to do it with a sombrero he found... silly boy! 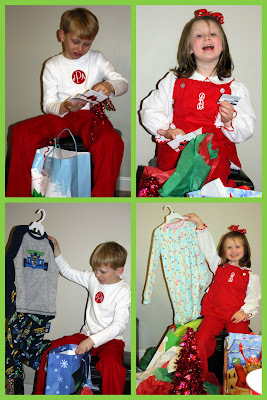 the kiddos opening presents... they got new pjs and movie tickets... can i tell you how EXCITED i am that we did NOT bring home ANY new toys... whoop whoop... but yet we have some much need cute new pajamas and some movie passes... we are already planning our movie dates... jackson and daddy want to go see yogi bear and brylee and i want to go see tangled... we can't wait! thanks kk and nannie and mark! well we have 1 christmas celebration down... only 5 more to go!!!!! tis the season... i love seeing your happy kids!! !